Get to know the little fasteners that have the big responsibility of holding everything—furniture, decks, walls, and more—together. Though they’re not much to look at, screws hold a place of honor in the construction, hobby, and furniture-making industries. 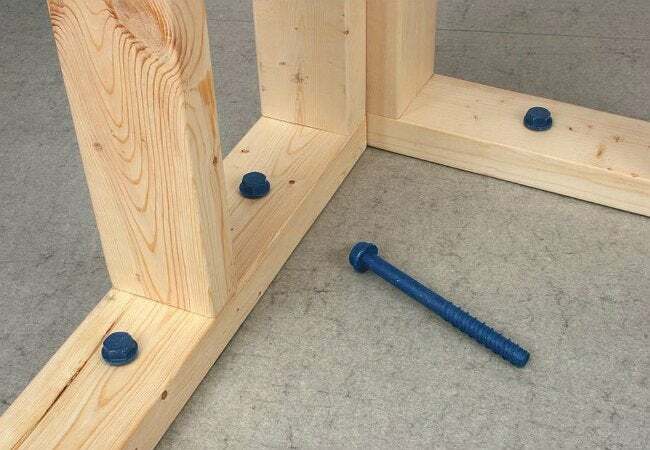 From wall framing and cabinetmaking to everyday projects like building a wood bench, these lowly fasteners literally hold everything together—so it’s crucial that you choose and work with the right ones. The screw aisle at your local hardware store spans so long with seemingly endless options for this exact reason: Different projects require different types of screws. The more time you spend building and repairing around the house, you’ll get to know the following five types of screws—and when to use them—rather well. In the meantime, read on for a primer to help distinguish one variety from another and simplify your next trip to the hardware store. Before we talk about which types of screws are right for the specific projects on your to-do list, let’s talk about how most screws are inserted today. For best grip, the design on the screw head coordinates with a specific screwdriver or power drill‘s bit. Take Phillips screws, developed by the Phillips Screw Company, as an example: This popular fastener is easily recognizable by the “+” on its head and requires little more than a Philips head screwdriver to twist it into place. But since the invention of this in the early 1930s, the number of options for screw heads has expanded to include recessed 6-point and 5-point stars, hex- and square-head designs, and a numerous combined designs, such as a cross between recessed square and Philips head that accepts multiple bits. Bottom line: When shopping for a fastener for your project, keep in mind that you’ll need to coordinate the screw head design to the right bit. Fortunately, drill bit sets come with multiple bits, which fit virtually every standard screw head size and design configuration. Wood screws feature coarse threads to grip the wood securely until the top of the screw shank, just under the head, where it is often smooth—a design that allows tighter connections when attaching wood to wood. As the screw is drilled to nearly its full depth, the smooth part at the top of the shank spins freely so as not to force the head deeper into the board. Meanwhile, the threaded tip of the screw bites into the bottom piece of wood, drawing the two boards snugly together. The tapered head of a wood screw allows it to sit flush or slightly below the surface of the wood. When choosing screws for basic wood construction, select a length that will allow the tip of the screw to penetrate the bottom board by about 2/3 the thickness of that board. While on the subject of sizing, widths also vary from #0 (or 1/16 inch in diameter) to #20 (or 5/16 inch in diameter). The most common size is #8 (approximately 5/32-inch in diameter), but the appropriate size of screw will depend on your individual project. 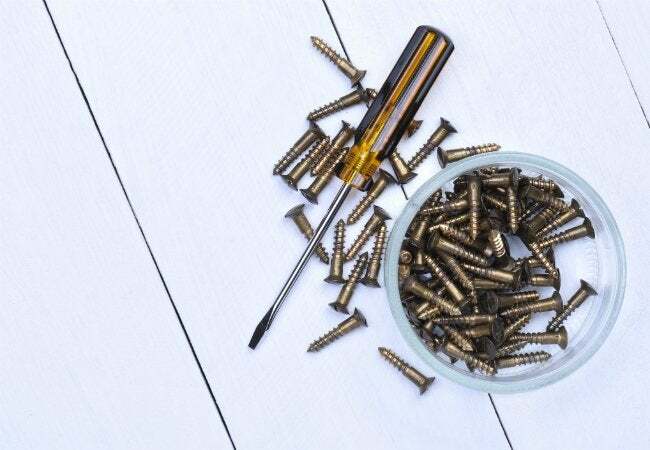 Finish wood screws, for example, are designed for attaching trim and molding and therefore feature smaller heads than standard wood screws; these are tapered to allow you to insert the screw just beneath the surface of the wood, leaving a tiny hole that you can fill with wood putty. Wood screws come in both interior and exterior styles, the latter often galvanized or treated with zinc to resist rusting. For exterior projects specifically using pressure-treated wood, look for Alkaline Copper Quaternary (ACQ)-compatible wood screws. These will not corrode when used in conjunction with wood that’s been pressured treated with copper-based chemicals. 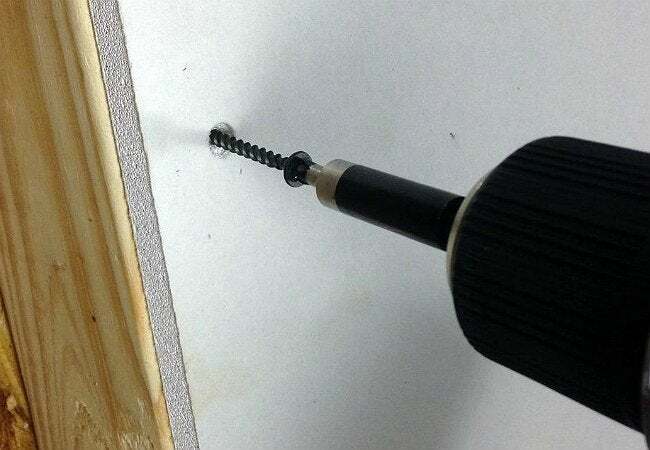 Traditionally, inserting screws in a way that prevents wood from splitting wood requires DIYers to first drill a pilot hole and then apply the screw. Types of screws identified as “self-tapping” (also called self-drilling screws) feature a sharp tip that mimics the drilling action of a drill bit, making predrilling a thing of the past. Since not all wood screws are self-tapping, be sure to read the label carefully. Best For: Connecting wood to wood. For basic installation of 1-inch thick boards to wall studs, such as when setting cabinets, we like the self-tapping SPAX #8 2-1/2- inch Philips Square Drive Flat-Head Full Thread Zinc Coated Multi-Material Screw ($7.98 for 1 lb. box at Home Depot). 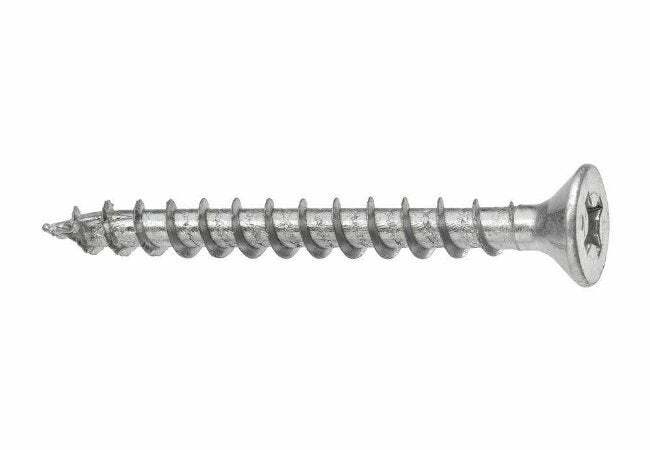 Intended only for installing drywall panels, these types of screws range in length from 1 inch to 3 inches. Their “bugle” head is designed to countersink slightly in the surface of the drywall panel without tearing the panel’s protective paper covering. No predrilling of holes necessary here; when these self-tapping screws reach the wood studs or joists, they dig right in. Standard drywall screws are suitable for installing drywall panels to wood framing, but if you’re installing drywall over metal studs, look for screws that specify use with metal studs. Note: You’ll also need to invest in a drywall dimple bit to install these, since it isn’t always included in a standard bit set. This resembles a Philips head bit but features a small protective ring, or “shoulder,” near the tip of the bit that prevents the screw from being installed too deeply. Best For: Installing drywall on wood or metal studs and joists. To install a single layer of 5/8-inch drywall to wood ceiling joists, try Grip-Rite’s #6 x 2 in. 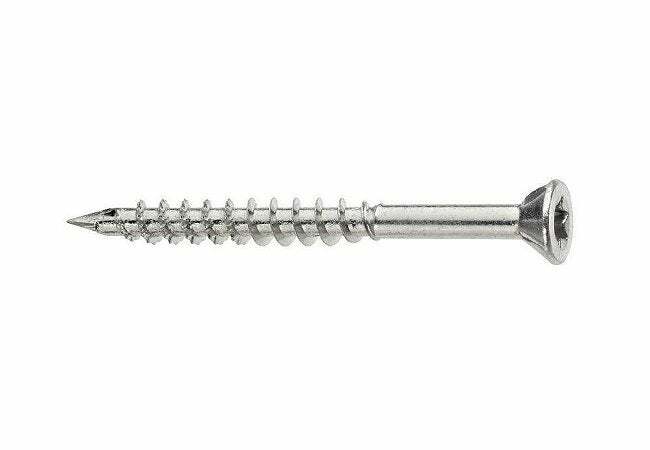 Philips Bugle-Head Coarse Thread Sharp Point Drywall Screws ($6.47 for a 1 lb. box at Home Depot). Their phosphate-coated heads help drywall compound adhere during taping. Use with Bosch’s #2 Philips Dimpler Drywall Screw Setter Drill/Driver Bit ($12.47 at Home Depot). The first thing you’ll notice about masonry screws, also called “anchors,” is that they’re not pointed at the tip. A masonry screw does not bore its own hole; instead, you must predrill a hole with before inserting the screw. While some masonry screws have Philips heads, many have raised hex-heads that require installation with a specific matching hex-head bit. Check the screw’s packaging for which bit and exact size are needed to predrill holes and then drill in the anchor. A hammer drill with masonry bit is necessary for predrilling, but you can use a regular drill to insert these screws. Best For: Attaching wood or metal to concrete. One of the most common uses for masonry screws is to attach wood floor plates to a concrete foundation or basement floor. A good choice for this task is the Tapcon 3/8 in. x 3 in. Hex-Washer- Head Large Diameter Concrete Anchor ($19.98 for 10 from Home Depot). The screws used to fasten decking, or “deck flooring,” to a deck’s joist system are designed to countersink so the tops are flush or just a hair below the surface of the wood. Similar to wood screws, this specific exterior screw features coarse threads and a smooth upper shank and is manufactured to resist rust and corrosion. If you’re installing pressure-treated wood decking, use only ACQ-compatible decking screws. Composite-decking manufacturers specify the use of stainless steel decking screws to install their product. Their length varies from 1-5/8 to 4 inches long and they are specifically labeled as “Decking Screws” on the package. Many decking screws are self-tapping, and come in both Philips and star-drive heads. Best For: Installing exterior decking. For installing standard 5/4-inch decking boards, you can’t go wrong with Deck Mate’s ACQ-compatible, polymer coated #10 x 3-1/2 in. Star Flat-Head Wood Deck Screw ($26.94 for a 5 lb. box from Home Depot). Medium Density Fiberboard (MDF) often appears in the home in the shape of interior trim, such as base and molding, and in the construction of some assembly-required bookcases and shelving. Harder than solid wood, MDF is more difficult to pierce using regular wood screws without splitting. That leaves two options: Predrill pilot holes in MDF and use regular wood screws, or reduce your work time and use self-tapping MDF screws. The MDF screws come in the same sizes as regular wood screws and feature star-drive heads, but are designed to eliminate splitting and the need for predrilling. Best For: Use with MDF material when predrilling is tedious. For attaching ¾-inch MDF casing to a door frame, we recommend SPAX’ #8 x 1-3/4 in. T-Star Plus Drive Partial Thread Zinc Coated Medium Density Fiberboard (MDF) Screws ($6.97 for a box of 200 from Home Depot).